Bison played a pivotal role in the settling of the North American continent. Roaming freely across the United States and Canada for centuries, native tribes relied upon the creatures for food, clothing, and shelter. Later, European settlers relied upon the bison in much the same way. 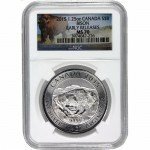 The Royal Canadian Mint honors this majestic creature on the new 2015 1.25 oz $8 Silver Canadian Bison Coins. Now, you can buy these coins from Silver.com with PCGS MS69 grades on First Strike edition coins. The 2015 1.25 oz $8 Silver Canadian Bison coin features a new design on the reverse and integrated security features, but it is unique in more ways than these. 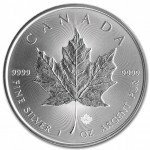 This coin represents the first time that the Royal Canadian Mint has produced a silver bullion coin weighing 1 1/4 troy ounces. Radial lines have been machined onto the rim on both sides of this coin as well, with micron-level specifications, to enhance security in the face of counterfeiting. 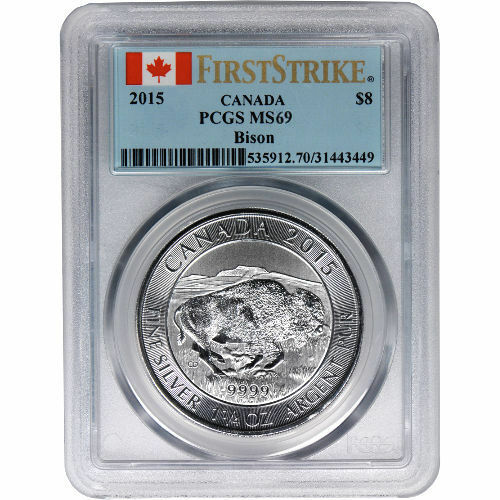 2015 1.25 oz $8 Silver Canadian Bison coins in this particular lot come from the First Strike program, which designates coins received during the first 30 days of the Mint’s release. The Professional Coin Grading Service certifies these coins as MS 69. This means each coin has an attractive, sharp strike on the year and mint mark, with few small but visible abrasions on the coin. 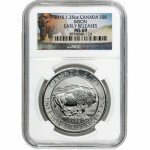 On the reverse side of the 2015 1.25 oz $8 Silver Canadian Bison coin is the image of a lone creature rumbling through an open field. Engravings on this side of the coin include “Canada 2015” and the weight, purity, and metal content of the coin. 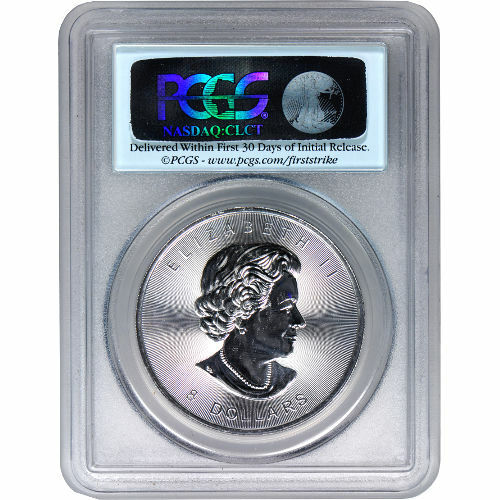 The obverse side features the right-profile image of Queen Elizabeth II as designed by Susana Blunt. Her Majesty’s portrait is surrounded by engravings of “Elizabeth II” and the face value of the coin in Canadian dollars. Silver.com is dedicated to customer service and strives to ensure that our customers are 100% satisfied with their purchase. Whenever you have questions about our products or services, don’t hesitate to call our associates at 888-989-7223, or connect with us online via our web chat service.